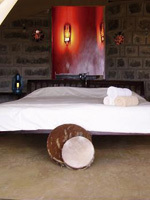 Maili Saba Camp is conveniently hidden at just a twenty minutes drive from lake Nakuru National Park. Here game viewing can be combined with a quiet pick-nick overlooking the flamingo dotted lake. The wonders of nature can be visited either at the hot springs of Lake Bogoria where you can boil your own eggs as is a local custom among Kenyan visitors to the springs alternatively you can have lunch at the Thomsons Falls or visit Hell’s Gate National Park near the sweet water of Lake Navaisha. The Rift Valley provides one of the most breathtaking sceneries in the world. Don’t hesitate to ask us to organize your tailor made activity programme since golfing, hiking, biking, horse riding and ballooning are within our reach. - On call medical practitioner. - Shuttle service to and from Jomo Kenyatta International Airport.